Hello all. After a nice Friday night, work was not nice Saturday or Sunday night's. I got a new patient Saturday night, whom I think her family dumped. One of the day shift nurses, thinks her family drugged her, to get her to our facility on Saturday. I am sticking with dumped, as her family never came to see her on Sunday, and left ASAP, Saturday. She spiked a fever of 102, Sunday night, with rhonchi lung sounds. She does have COPD, after years spent smoking. She can't stand. She is not fully cognitive aware. Resident ordered blood cultures, IV antibiotic and chest x-ray. Because we don't have a full-time lab, it took our best nurses an HOUR to get those blood cultures and get IV access. She is dehydrated. I am not good with sticking folks. I didn't even try. Rehab patient??? And then, the powers that be, handed us a "time study," to be completed only by weekend shift nurses. The DON actually wrote that she wanted to know what nurses do on their 12 hour shift. I wrote: How would you not know what we do? I also included the 30 minutes I spend working off the clock, organizing my shift. And I included time doing "stupid stuff," such as going to another unit for supplies such as OJ, ginger ale, spoons. Yeah, I'll tell you how I really feel! I didn't bother with the exercise Sunday night. I simply told House: No, I'm not doing it. Mani-pedi today. Book club tonight. Have a great day! Weird to experience the time changes flying "this" direction, Tweety. I think the transatlantic crossing ppl took before there was airline travel, took 5-7 days. I assume one adjusted slowly, and perhaps experienced no "jet lag" (hence the origin of the term! only from riding in a "jet"!!) upon arrival to port. I would like to do a transatlantic crossing sometime. Just 'cuz. Today I did case mgmt. It was steady all day, and I didn't have time to clear all my view alerts from my five days off. Will work on that tomorrow. Dh will likely go to a jam tonight. He and the jazz band (guitar, banjo, bass) play tomorrow night at a local bar, for 30 min or so. I may go listen. It has sprinkled on and off today, which surprised me. Wasn't expecting precipitation. It's nice to be home. As dh and I have aged, we have become poster "children" for that meme that says marriage is just two people who live in the same house and shout "What???" to each other from within the house. Yup, that's us. We both are asked to repeat ourselves, frequently. We both have tinnitus. Mine, I think, has more than one cause. Latest is allergies, as I hear crackling noises if I massage below the right pinna, and I can hear sloshing when I walk. I take a nondrowsy antihistamine daily, but I think it's time to break out the two nasal sprays and administer. We will help with music this Friday night, at the Hymn Sing at Oak Glen. Then, our youngest ds texted today he would like to return to the RenFaire on the weekend, with his wife and with oldest ds. Seems Saturday is best for oldest ds (he doesn't have to be to work till 7pm), so we will go then (Sat). Can rest up on Sunday before hitting the work week again. Time to wash the garb! I washed all the RV linens and took them back out. Yesterday had already cleaned the floor and surfaces. Not that it will last; it will be dirty when we break it out again (sometime in late May, I believe), but at least I have cleaned the dirt from THIS outing. It was quite dusty at the horse ranch (to be expected!). Nel, I agree: pt was not rehab material, needed to be in an ED! And shame on that family. Though perhaps they had caregiver fatigue, or some component of it. Hope things are better this weekend when you work. For now, enjoy the horses and cats and barn chores and etc! Joe, me too: hope J's friend improves quickly. And congrats on your weight loss! Re: Notre Dame: seems the organ survived (though how play-able it is, remains to be seen. It may need some renovating), and the huge rose window. France's president has promised to rebuild, and money from many sources, both in France (private) and from other countries, has been pledged. The history of this work of art has been interesting to review. It is truly a beautiful sight to behold, and it seems it is dear to the French (not a sign of any religion, but just that the building has been part of Paris for so long, damages to it are like hurting one's dear friend). I am not as eloquent as others, though, for describing this way of viewing Notre Dame. 'Nuff for now. Have a good evening! 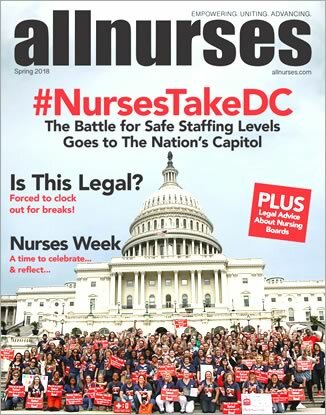 Stars, I am contemplating sending an email to our CEO, to let her know how alarmed I was discover that our DON, apparently doesn't know what nurses at the facility do, during a 12-hour shift. Oh, my. We are looking at the end of a S. Louis vs Cinncinatti baseball game, while the Braves game has to wait out their weather delay... there was a series of brief little interviews with the (ie, not "ours") players, and Nannie says, in complete earnestness: "Listen! They sound just like Americans!" Huh. Imagine that. I'm retired now. I did hospital nursing for 42 years. Before getting report I put aside my outside life to do my best to provide safe, effective, competent care to my patients. Before and after work, and on break I could enjoy hearing about others lives and sharing stories about my family and life outside work. I was working last night, so I didn't see any of the 60 Minutes interview with Speaker Pelosi. But she must have done an outstanding job because Trump went off the crazy train rails lobbing juvenile attacks against her last night and this morning. I did read some the comments she made during the interview, in today's WaPo. Completely agree with the Speaker, that Trump shows us all who he is daily. Yes, he does. And I reject the image daily.